If you would like to nominate yourself for this position please email the Secretary. For as long as I can remember, I too have wanted a Saint Bernard. Mum tells me that as a toddler I would sit for hours gazing out the window watching the Saints in a neighbour’s backyard. Now some 40 years later, I am still gazing out the window, mesmerised by my own gorgeous Polly. Growing up I was always surrounded by dogs, yet none have left such a BIG imprint – either in character or stature! Polly is an absolute delight and never fails to impress or entertain with her wonderful disposition. As a first time Saint owner the support, advice and guidance I have received from members of the Club has been invaluable. Whilst I am not involved in showing, the Club warmly welcomes exhibitors and social members equally. I have been a passionate Saint pet owner for 16 years. 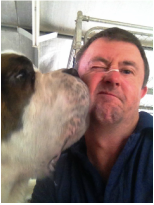 My involvement with The Saint Bernard Club NSW started 16 years ago when I unfortunately had some significant issues with my first girl. I turned to the Club for advice and have since enjoyed the copious advice & friendship the Club has offered me. I now want to return the favors and friendship to others and hope that I can do that. My fur kids have come from different breeders – Victoria, Tassie and NSW and I love the different personalities & attributes each have brought to my home. Currently I have two Versoix rough coats; Jade (8) & Bertie (1) who share the same Dad, Bear… and my sweet “personality plus” smooth coat Casperscove Poppy (4). I can’t imagine life without any of them but sadly I’ve had my share of the sadness & broken hearts that comes with owning a Saint too. I am besotted with the breed and have met so many wonderful people through my fur kids. I encourage everyone who has a Saint or is thinking about owning one of these very special giant breed dogs to join the Club. The wealth of knowledge is there for the asking and can be invaluable. I became involved with the Club just on 19 years ago after Humphrey, our first Saint, arrived with a thud in our lives. He began to make some monumental changes - all great I must add! I can't imagine my life without ever having had him and then Rupert and now Fredd and Henry. And I have met some great people over the years through the "dog world" and the Club. It is good to work with people who are committed to the breed first and foremost and work happily together for the Club and its Members.